At 1.30 in the afternoon Russell School walked all the way to the hall. Next Russell School welcomed the year 6 who are graduating. Later we had cup cakes and walked to room1 and went home. On Monday the 18th of November in the afternoon some famous motorbike people came to Russell School and they had to introduce themselves and some people came from Wellington and others lived in the North. Next one person from each class got to sit on any motorbike and the people that got to was Tony, Soni, Zung Bawn, Rangihana,Oceana and I. We were the only six children from Russell School who got to sit on any motorbike that looked stunning. After that we all left. When I got to school in the evening I traveled to the junior park and played until I got tired. H.E.A.R.T People talked about the community how they helped us to close the liquor store across from R.S. We ate tasty food. We walked home to sleep. On Thursday the 5th of September we had a concert at Hosanna hall. At 5:30 we had chop suey to get ready to Sing He Kakano Ahau and do the action to Kapokapo jump jam and the kapahaka and choir people to do action to a song. At 6:30 Rm 1 was doing their item called Can Good Over Come Evil? When Ailani and I were finished talking we had to take 1 chair each and take it off stage so we can do What The Time Mr Wolf. Rm 6 did a dance called Bangra. Rm 7 did action to the song called Just The Way You Are By Bruno Mars. At the end we had a flash dance just for the audience. On Tuesday Willie was walking along the path. He had no friends. Then he walked away with his head facing down and there came a jogger. Willie and the jogger were looking back, then, SMACK! Willie said, "I'm sorry." "No, I'm sorry," said the jogger. I wasn't looking where i was going. My name is Hugh, do you want to be my friend. "Sure," said Willie, and they walked away happily and they ran with the other apes. My favourite book is Max and the Chocolate Chicken. I like this book because Max ate the chocolate chicken by himself and the easter bunny came back and he shared it with everyone. Max was really excited that it was Easter that he dressed up to find some eggs. Max's sister found the most eggs. hi it's Joella i am learning to do time table and counting down from 52 and I am in the highest group name diamonds. the peoples name in diamonds is me and Denis, Eli, Ezra, Teve, Erica, Ailani and Amelia. 4 weeks a go Whaea Kirsty came to room 1 to visit. Whaea Kirsty didn't just come by herself she came with her dog named Hooch and her husband named David. When Hooch came in everyone was scared of him, because he had sharp teeth and he was big. When Whaea Kitrsty came and sat down she told us all about Hooch. He goes to dog shows and he jumps through rings. He wins medals because he listens to Whaea Kirsty. Because he wins medals David trains him everyday. When David trains Hooch he has to always listen to him and follow instructions. When ever he is good he gets a special snack. When we finished asking questions we got into a circle so Hooch could come around and we could pat him. We could kiss him too. 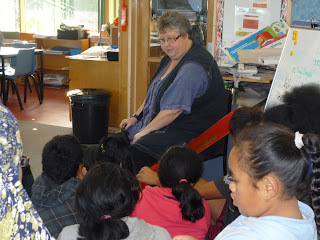 Last Wednesday Whaea Jen told us that a gecko was coming into our classroom with a lady called Jenny Whyte . We were surprise that a gecko would come into a classroom. Later Jenny Whyte and a green gecko and two brown gecko came into our classroom. When she came into our classroom we were so excited and everybody was sitting on their kness. Soon everybody got to hold a gecko and some people holded a green or brown gecko. By Denis Johnson Sitama Tupuola. Whaea Kirsty is leaving so she bought her dog to visit us for a treat. She talked about her dog and fed him so that he would sit still. We could pat the dog at the end of it and he loved lots of kisses. His name was Hooch. Hooch shows in the show his name is Renegade Midnight Storm. He can jump very well and wins lots of ribbons. Last Wednesday it was Wheels Day for the Juniors. We had to bring in some wheels and a gold coin donation to be able to ride our wheels by the netball court. We loved going on our wheels. I hope it's going to happen again! So far this year we have been doing lots of running. We have set a goal to be able to do 3 laps of the top field without stopping. Later this term we are going to be swimming, we are really excited about going swimming. This week the dentist van has been here and the dentist has been checking our teeth.